I really love the industrial-meets-arty-meets-big-fish-tanks look of this place. They had about 16 of their own beers on tap with some nice guest taps as well. The Avatar Jasmine IPA was really unusual and worth a try! I really liked a set of pale ales made with experimental as-yet-unnamed hops called Beaker and Bunsen. Meep! I have very pleasant memories of randomly being at this pub for their Great Pumpkin celebration a few years back, when they changed all their taps to serve pumpkin beers. 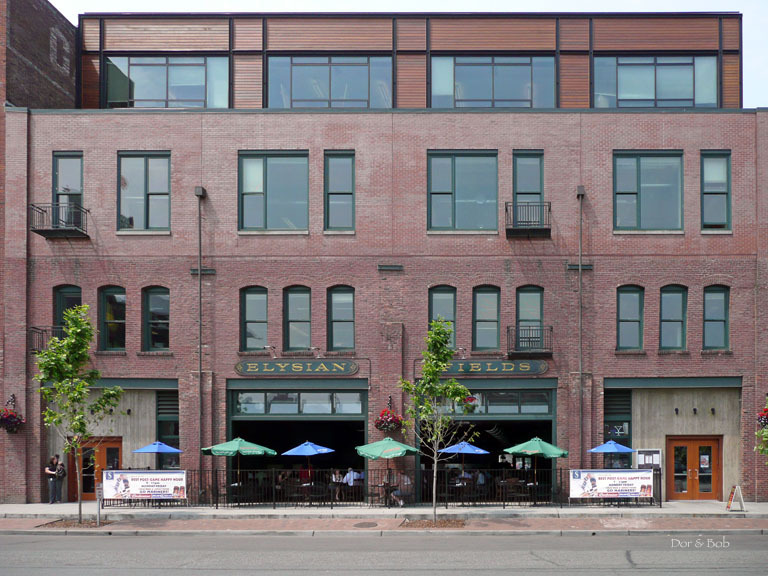 Elysian Fields is the third Elysian location to open in Seattle, right next to the baseball stadium, Safeco Field. Itâ€™s a big place, filled with people that work in the area at lunch times (weâ€™ve never been there in the evening). The space runs from the entrance (and outdoor seating) across from the stadium all the way back to an entrance and more windows (and the brewery) on the next street. It has tall wooden ceilings with old-looking beams and exposed heating ducts as well as wooden floors. Wooden tables and chairs as well as some booths fill the areas outside of the bar. The bar is in the center of the space with stools all around. The walls are a washed blue/green color. There is also an aquarium by the entrance. Quite a wide selection of Elysian beers (seems to be more than at Tangletown), brewed on the premises. 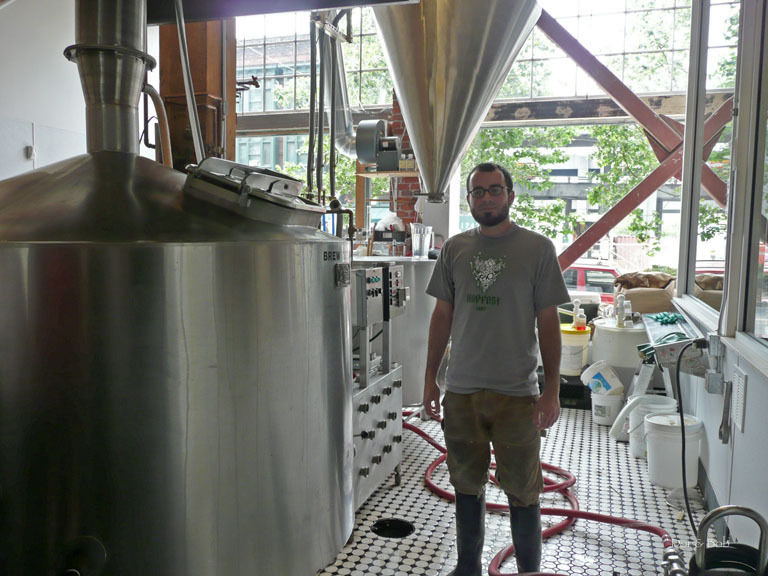 The brewery is a 4 barrel system with windows onto the street and to the seating in the restaurant. The beer is quite good here and there are always at least a couple new and innovative beers from a broad range of styles. The food is a cut above the average pub menu (good salads, sandwiches, pasta, etc. ), although you can get hamburger and fries if you wish. Sometimes the specials are described more ambitiously than they are executed (e.g., a salad topped with some sliced deli turkey described as a roast turkey salad), but they still taste good. This place has a huge selection of beers. They have a couple of staple beers and during my visit they had 13 specialty beers. My buddy and I stopped here while hopping around. The Cask IPA I had was great and the Maibock my buddy had was also good. Service was a bit slow from my waitress, but the beers themselves and the interesting options they have made it worthwile to want to come back. If I get a chance while I am still here, I will make an effort to go back to try their Avatar Jasmine IPA and the Loki Lager which both sound great. I get to Seattle fairly often for work. I have an annual Mariners outing for one of my larger clients. I was happy to when this place opened, as Iâ€™ve been less than thrilled with the Pyramid Ale House. This Elysian Fields occupies a nice older warehouse that has been redone. They have some great high ceilings, wood floors, big beams, and some good design work adds up to a nice space. There is a large bar in center and various seating areas around the perimeter. I like how the establishment fronts two different streets. Fantastic bathrooms with really cool glass sinks. They offer about 8 of their own beers on tap and a cask option. They have about 8 guest taps, which strangely included Coors light and MGD. To be fair, the rest of the Guest taps were solid choices. They also have some good bottle offerings. I guess with crowds that go to the Mariners & Seahawks, some macros are a necessary evil. The food is innovative and pretty decent. As the place has matured, the staff and the kitchen have really improved. Great fries by the way, they kind of remind me of the Brew City Fries you get in Wisconsin. I will be back and can recommend this place over the Pyramid because of its better beer, better food and for the lack of attitude by the staff. I have had the Stout, ESB on Cask and the Pale Ale.